You are here: Home / Healthy Eating / What is the Keto Diet – and What Isn’t It? The ketogenic diet redefines what we think we know about nutrition. In the last few years it has gained popularity through the media as a trendy weight loss diet. While it’s true that many people lose weight on the keto diet, the first records show its use in much different contexts. Where Does the Keto Diet Come From? There are records of keto fasting as early as ancient Greece (500 BCE). However the Greek weren’t striving to look slim in their toga, they used fasting to control epilepsy. Keto and fasting became more common in the United States as early the 1920s, also to treat epileptic seizures. More recently, in the 1990’s a producer named Jim Abrahams reignited interest in the ketogenic diet when he shared that his son was using it to control his epilepsy. Since that time it has become a hot topic in the academic and medical worlds as well as mainstream fitness culture. 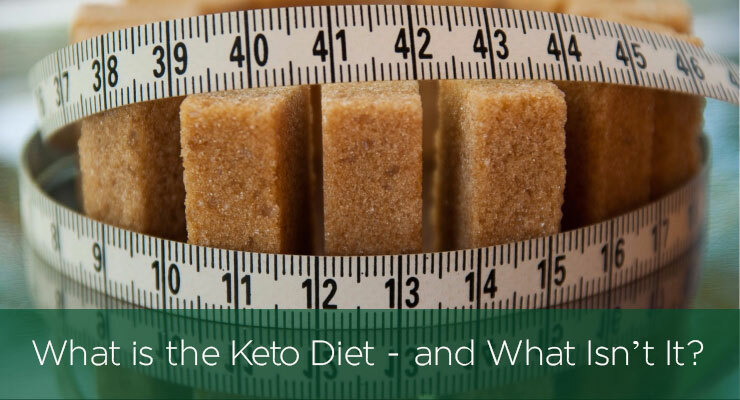 Nowadays many thousands of people around the world follow the keto diet for a wide variety of reasons: medical conditions such as epilepsy, diabetes, and PCOS; weight loss, mental clarity, sports performance, etc. “Keto” broadly refers to the ketogenic state – when the body uses ketone bodies for energy instead of glycogen derived from carbohydrates. This is only achieved when you strictly limit your consumption of dietary carbohydrates, and eat plenty of fats to support ketone production – which is commonly referred to as the “keto diet”. Don’t think of the keto diet as a set of dietary rules, think of it as the nutrition used to achieve and support the state of ketosis. This typically involves consuming less than 50g of carbohydrates per day, and consuming about 60-70% of daily calories from healthy fat sources. Being “keto” is not a set of rules, it is a biological state. The goal of the diet is to achieve “ketosis”, which is the way your body creates and burns energy. While eliminating sugar is vital to maintaining ketosis in the long-term, one or two grams of sugars hidden in your salad dressing does not make you “not keto” as long as your body maintains a state of ketosis. However, most of these foods can be ingested in very minimal amounts without kicking your body out of ketosis. Another common myth is that all low carb diets are keto, or that you can follow a “mostly keto” diet. Some low carb diets strictly prohibit sugars and grains but allow unlimited vegetables, while others encourage a large increase in protein consumption. Both of these examples may make it hard for your body to reach or maintain a state of ketosis. Similarly, even if you follow a “mostly keto” diet (i.e. follow similar dietary guidelines with some exceptions,) it’s likely that you are not reaping the benefits of actually being in a state of ketosis. How Do You Know If You’re Keto? It is likely that you will notice natural signs when your body enters ketosis. The smell of your breath and urine may change, and you may feel thirstier throughout the day. There are also easy and affordable tests that measure ketones through blood, urine, or breath analysis. Testing your ketone levels is smart, especially when you are just starting out. While it’s relatively easy to eat keto-friendly foods, you won’t reap the benefits of the diet unless your body actually reaches and maintains a state of ketosis. Eat Clean to Be Healthy and Lean!